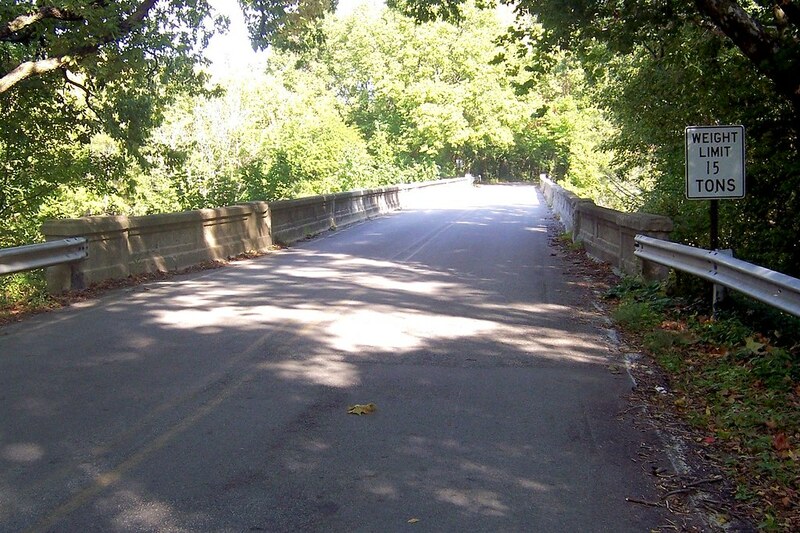 A friend and I were cruising through southern Indiana one warm early-autumn day, skirting Camp Atterbury’s eastern boundary on an old alignment of US 31, when we came upon a narrow bridge with obvious and unattractive guardrail repair. 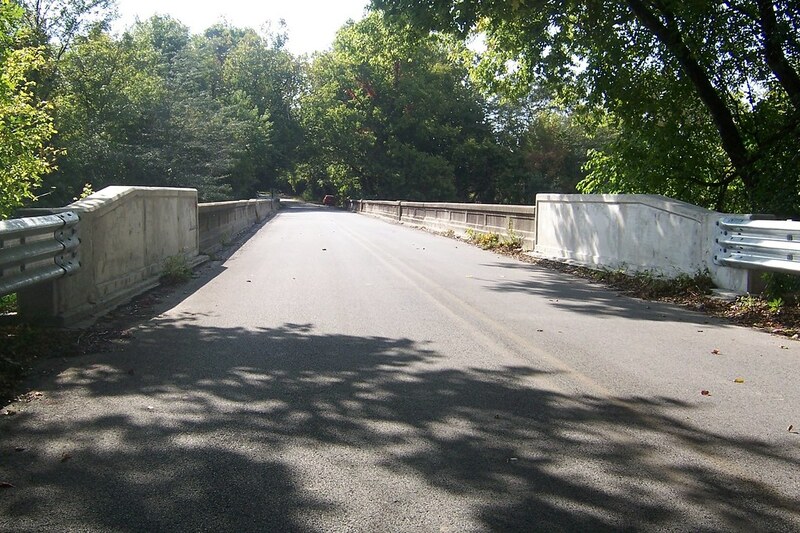 This bridge matters because it is on the Madison State Road, completed in 1824 to link the Ohio River town of Madison to the new state capital at Indianapolis. It also matters because it is a kind of bridge the state highway commission built from the late 1910s through the early 1930s, many of which have been removed. The survivors are on minor highways or, like this one, on roads that were once highways but have since been bypassed. 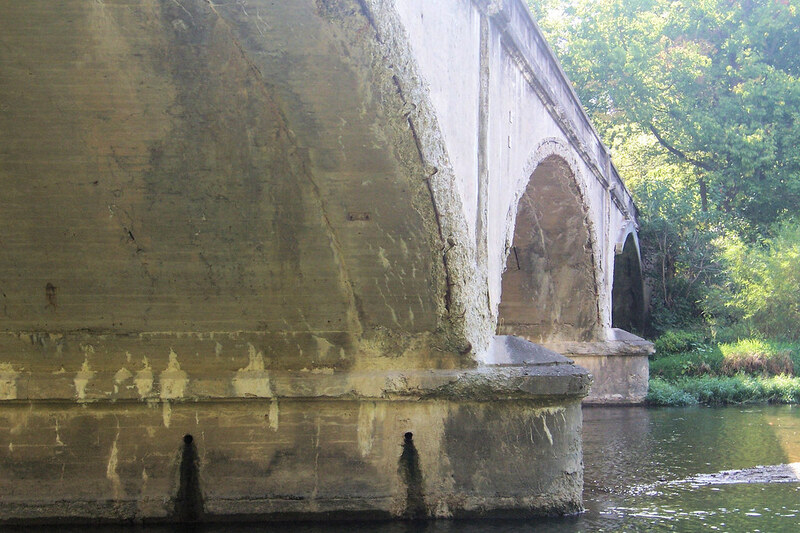 These bridges are entirely unremarkable as you drive over them. It’s what’s below that counts. 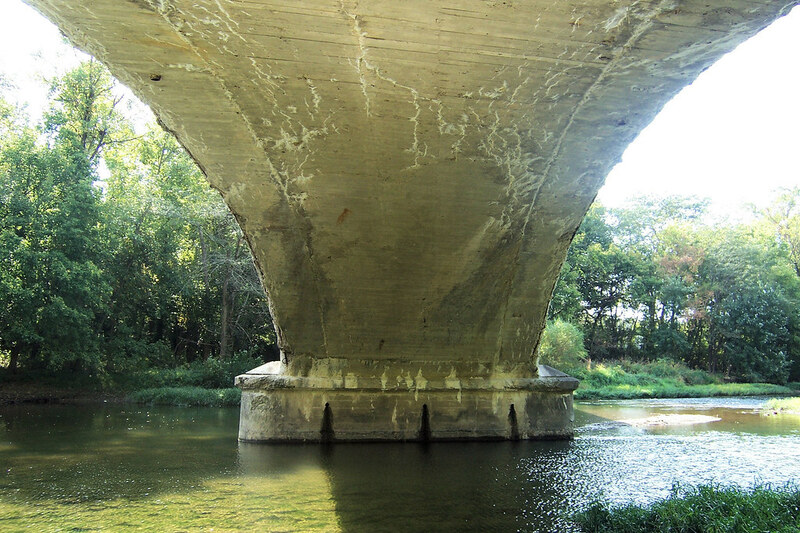 Modern highway bridges are just slabs supported by piers; they’re nothing to look at. This particular old girl, on the other hand, has three graceful arches (that have seen happier days). The old guardrail lay in large pieces next to the bridge, making it easy to climb down the riverbank. If I could have lifted any of the chunks, I would have been sorely tempted to haul it home. I’m not sure what I’d have done with it, though! Under the bridge it was easy to see outlines of the boards used to create the formwork into which which the concrete was poured. This photo shows a similar bridge under construction in the 1920s, its wooden falsework partially in place, creating arches. A formwork is placed on that and concrete poured into it. 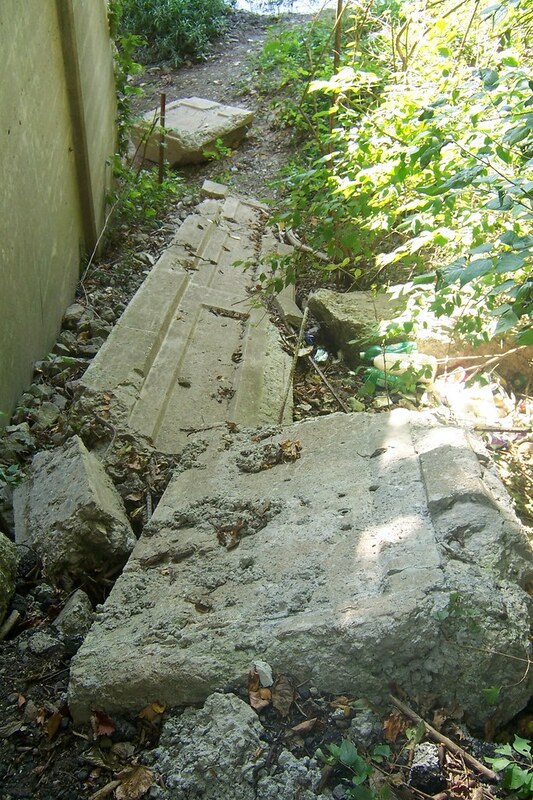 The original guardrail remains at the bridge’s south end. It’s hard to believe, in this age of nine-lane freeways, that a bridge this narrow could ever have been part of a US highway. It’s sad that this old bridge has been so neglected and that its repairs have not been sympathetic to its design. I took several more photos of this bridge, and they’re all available here on Flickr. Those are some great photos! You raised a couple good points, I often see historic ruins I want to haul off.. but where would I put them! I’d have the largest collection of ancient cement slabs in the world. Ryan, I agree about the modern bridges. What I know about bridebuilding would barely fill a shot glass, but my guess is that the slab/pier design so prevalent today is the low-cost method. My Son studied Civil Engineering, at Rose-Hulman. The problems Civil Engineers have in building bridges, in today’s World, is budget and time. Teddy, I’ll bet budget and time have always been constraints. “Good, fast, cheap, pick any two” is an old saying! A man after my own heart. I am posting a link to your page on mine. Searching The South. Awesome pics and great history. Thanks for sharing this. As a fan of old roads (and Interurban remnants), I’d like to ask for any specifics you might be able to provide on the location of this particular road and bridge, as I would like to visit it on our next “long, aimless drive”. 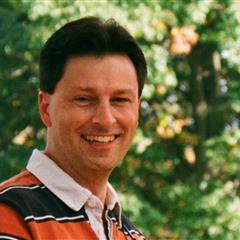 I would also like to compliment you on your captivating blog; I wish I could do something as nice! I’m glad you’re enjoying my blog, and hope you’ll subscribe, as I post through every summer about the road trips I take.